The Lifebook U938 has a bucket of power under the hood, and a colorful exterior too, although battery longevity isn't a strength. Compared with other brands, Fujitsu had been behind the curve in implementing the latest mobile platforms from Intel. But its most recent devices do use Intel 8th-gen technologies, and those parts allow for some spectacular machines to be built. High performance and super-lightweight are often mutually exclusive features, but in the Fujitsu Lifebook U938, they successfully coexist, for the most part. Cramming a punchy processor, memory, storage and a 13.3-inch 1080p display into this svelte chassis must have been a tough engineering challenge. Building on previous Lifebook designs, the Fujitsu engineers executed their design brief almost flawlessly. They've created a laptop that is easy to carry, pleasant to use and lightning quick. Yes, this PC comes in black too, but then that wouldn’t offer the same level of attention-grabbing that this machine truly deserves. The UK pricing for the review model covered here is £1,798 exclusive of VAT (£2,157.60 with tax added). The review model is one of four standard specs offered in the UK, and you can customize these with alternative memory and storage choices. Globally, the exact spec of these machines differs slightly, as do the upgrade options. For example, all UK machines come with the palm vein sensor. Whereas in the US you can have a fingerprint reader instead, reducing the cost a little. A machine with an identical spec to the review hardware in the US is about $2,450. 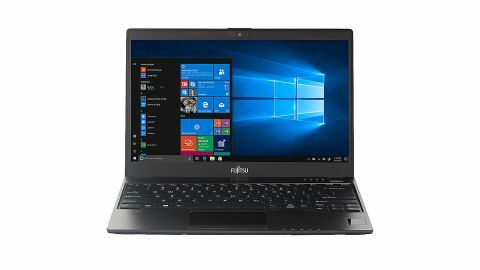 If you’ve spent this much on a laptop, you’d expect it to be a bit special, and the U938 fulfils those expectations in numerous ways. The first thing you’ll notice is how incredibly light it is, being just 920g (2lbs). That’s hardly anything for a machine with a display of this scale, and less than the majority of the Asus and Acer Chromebooks. The screen dictated many aspects of the U938 layout, as there is a narrow border to each side and above it. With the tight framing of the screen, the whole machine is less than 31cm wide (12-inches). Even with this limited space the designers still managed to fit a reasonably sized keyboard and useable touchpad in the available space. As an alternative to using the touchpad, the screen is touch-capable, and you can use a mouse via one of the USB ports. Being just 15.5 mm (0.6-inches) thin when closed, there isn’t much room for external ports anywhere, save for the sides. The provided selection includes a full-size HDMI out, two normal USB Type-A ports, a single USB Type-C with power delivery, a Smart Card slot, audio jack, Gigabit LAN port and a SIM card slot. We should mention that the SIM slot is only available on machines that include the integrated 4G/LTE module, a customer-defined extra. One slight disappointment is that Fujitsu went with a proprietary charger and not Type-C, even if the design includes one of these ports with power-sharing on it. A possibility exists that it can be powered by a Type-C connection, as that’s the technology that the official docking station uses exclusively. If true, that makes the proprietary PSU an even more head-scratching choice. Where this machine excels is in the quality of the keyboard, the touchpad and that lovely screen. If laptop builders get those features right, most owners will be pleased. The keyboard, in particular, is excellent. Short key travel makes for a light and yet very positive action, allowing for some blistering input speed once you’ve acclimatized. Our U938 also had a palm vein sensor to the left of the touchpad that uses PalmSecure technology for super-secure, contactless biometric authentication. But the standout experience is the screen, one that delivers a surprisingly strong gamut where portable systems aren’t renowned for color representation. It was so good that we couldn’t resist testing it with a color calibrator, but more on that later. From the outside, the U938 is generally great, but it’s the inside of these products that traditionally makes or breaks any design. A machine of this specification was never going to be a budget model, given the engineering expertise needed to shoehorn all that wonderful technology inside such a small case. It’s priced to compete with the Apple MacBook, a range that hasn’t yet got Intel 8th-gen silicon. The MacBook Air 13, for example, is still using the 2015-era Broadwell Core i5 (5th-gen), disturbingly. There are very few machines using the i5-8350U processor so far; most, like the Dell XPS 13 9370, are using the slightly slower i5-8250U instead. One machine very closely priced is the Dell XPS 15 9575. However, that is a 15-inch screen on a 2-in-1 solution that runs the i5-8350G processor. The ‘G’ designation of the CPU identifies this machine as one that includes the new Radeon RX Vega M discrete graphics. But, the Dell XPS 15 weighs more than twice as much as the U938, so it doesn’t occupy precisely the same Ultrabook niche. A more affordable option is the Lenovo ThinkPad X280, which when customized with the same processor, RAM and storage is about 80% of the Lifebook's cost. However, again the X280 weighs more, and the screen is only 12.5-inch. One cost effective alternative is the new HP Spectre 13, a machine that you can get with the Core i7-8550U processor, 1TB of storage and 16GB of RAM for just £1,699 ($1,840). Compared with the 8th-gen designs that have so far appeared, the U938 seems on the pricey side, but given the limited choice of Ultrabooks with this class of hardware, the cost is what the market will stand.